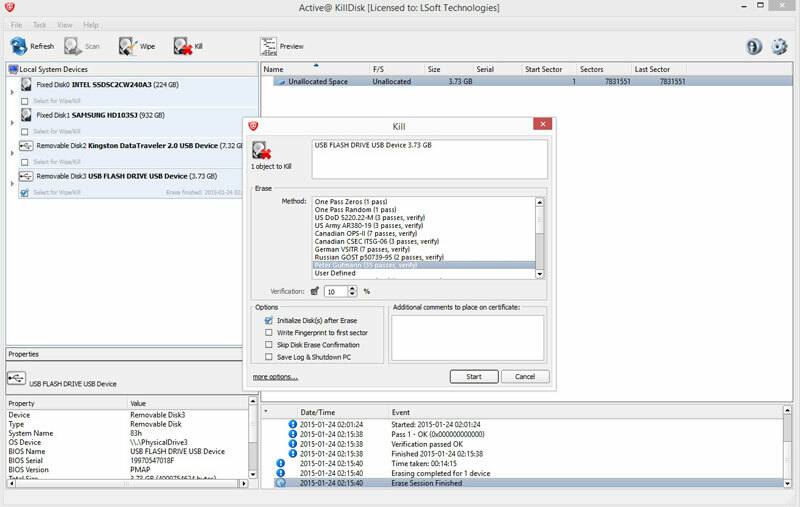 How to delete multiple drives with Active@ KillDisk? 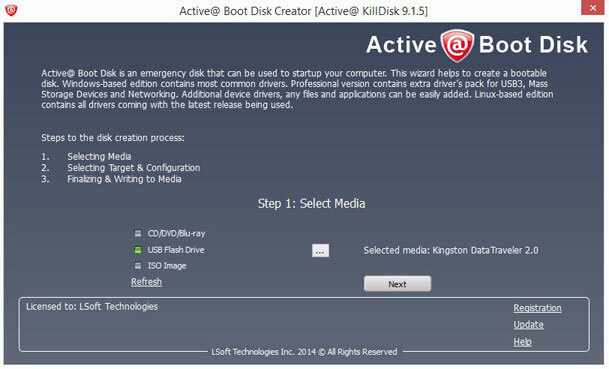 Contents > Blog > How to delete multiple drives with Active@ KillDisk? At some point in time all of come to a situation where privacy or business might be in danger of unwanted leaks. This does not to be a situation where you might be an outlaw running from the police, you are just might an ordinary person who wants sell his old HDD. In case you didn't know no files can ever be truly deleted using traditional ways, since all modern recovery programs can bring back those files and even whole partitions. This brings an issue of safely and permanently removing your files once you decide that you don't need them and want to get rid of them. LSoft Technologies introduces Active@ KillDisk, a very useful tool when you are in need of permanently deleting files that you do not want other people to see. The tool is reliable and flexible, but most importantly it gets the job done. We couldn't find a particular flaw in the software that it's worth mentioning. When it comes to price the Professional version is $49.5 for personal use and $69.95 for corporations. We believe that the price is justified; because a peace of mind, while knowing that your data will not end up on the internet one day. Active@ KillDisk comes with two main features Kill (erase all data permanently) and Wipe (cleanup an empty space). Once you launch the application the Scan will be initiated, showing you all of your physical and logical drives within your computer. For the testing purposes we decided to erase all disk data on our 3.73 flash drive and wipe all the empty space on our 7.32GB USB stick, not only to see how KillDisk works but also for you to have some sort of estimate when it comes to time required to finish its tasks. Of course this all depends on how your system is fast, state of your drive and wiping or deleting standard of your choosing. With that in mind we chose the fastest way One Zeros Pass method in our review, as well as US DoD 5220 method (the one you will most likely use) and Peter Gutman as the longest and the most complex one in the software. It's worth pointing out that we used i7 4770k CPU which worked at around 50% load most of the time. For an example when permanently deleting data, we chose Peter Gutman (35 passes) method. It took 9 hours and 20 minutes for application to delete all of the data on our 3.73 GB flash drive. However while choosing One Pass Zeros (one pass) the app finished the job in just under 15 minutes. Therefore if you want to be 100% certain that the data you want to delete is gone forever, do plan in doing it either over night or while you are not home. Having this in mind, people who made this software actually added an option inside KillDisk to turn off computer once it finishes its task. For wiping the free space we used a 7.32 GB flash drive. With One Pass Zeros it took around 80minutes for software to finish. When choosing a US DoD 5220 (3 passes) method it 7 hours and 47 minutes for KillDisk to wipe. But all that was nothing when we tried Peter Guntman. After less than an hour software has shown only 1% of progress and around 56 hours and 27 minutes until the end! Yes, that is a lot! Forgive us but we decided to take its word for it. We like to think that we might have saved some trees in some rain forest in Brazil by giving up on this last test and saving some electricity. 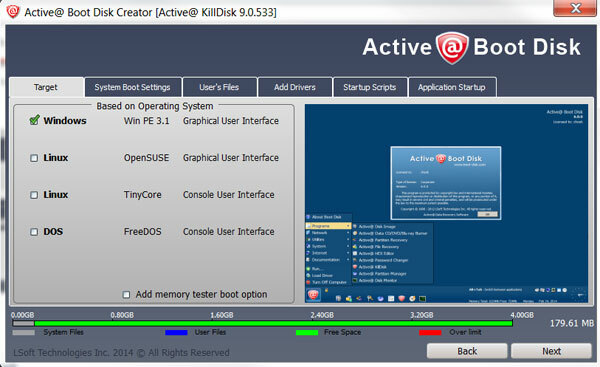 Active@ KillDisk comes paired with Active@ Boot Disk Creator, an application that will create a bootable drive based on the Windows PE 3.1 enabling you in permanently deleting your files from an outside source. Creating a bootable drive is a very easy task requiring you to only choose the drive you want to install Windows PE and click on Next a few times. 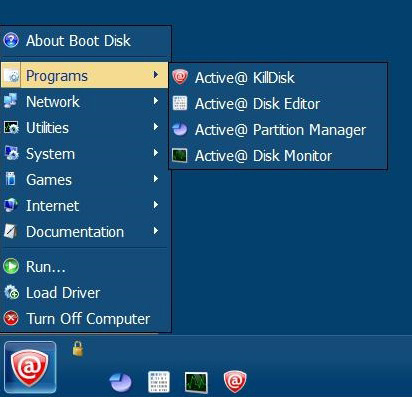 Once you created your bootable drive, all you need to do is reset your computer and choose this bootable USB in your BIOS under Boot Menu options. 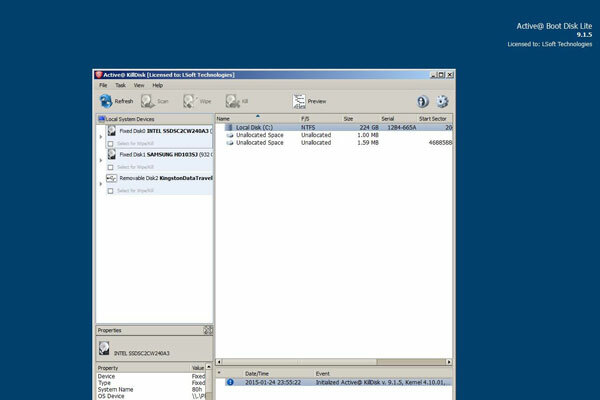 LSoft has also included additional software preinstalled within Windows PE: Disk Editor, Partition Manager and Hard Disk Monitor. WIN PE also comes with some basic games in order for the user to cut the time short, when KillDisk is doing its long wipe and erase operations. Apart from not coming in all the pretty colors as his full Windows version does, Active@ KillDisk has all the functionality of its counterpart. All in all, Active@ KillDisk is a well-built piece of software with a very specific purpose. Not all might see its use and after all not all of us might ever need it. However, today when you take a look at the tabloid papers or some internet news portals, you must at least consider that having one of these tools might not be such a bad idea.